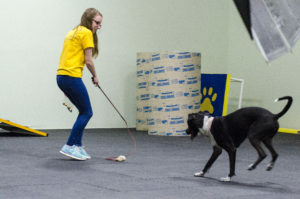 As you may or may not know, Canine Country Academy recently came under “semi-new” ownership. The founder Cathy Bruce created a great environment which lets each team member be an individual but also part of a tight-knit team. Paula Nowak has taken over the business from her previous head trainer position and is working hard to keep a fun, friendly, and relationship based environment. While you may have met one or two of us, we wanted to do a fun introduction of all of our current team members! What got you into dog training? My love of helping people and dogs have a great relationship like mine with Curly. Plus the fun in teaching both ends of the leash, learning about behavior and using critical thinking skills to resolve problems. What’s your favorite part about dog training? Creating fun ways to work through relationship and behavioral challenges. Learning should be fun. That applies to both teaching manner type skills as well as working through fearful responses. I might do this by creating a game, doing something silly myself to lighten the mood or use tricks. My favorite activity to do with my dog is going on adventures. That might mean to a Food Truck Friday or group class or competition or road trip or just a walk at the park. Something we would both enjoy depending on which dog I am focused on for that activity. Such a hard decision to pick just one since I LOVE tricks! The first that comes to mind is the leg weave. People find it very fancy. It’s actually very fun and easy to train. My number one choice would be Terriers. 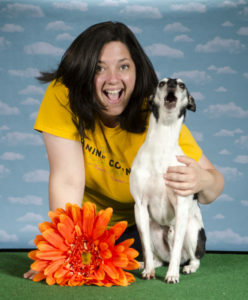 Specifically Rat Terriers and Toy Fox Terriers. My second choice is German Shepherd Dog. While I’ve never lived with a GSD I really enjoying working with them on a regular basis. Both of these breeds are incredibly smart, energetic, sharp and love to work. What more could you ask for in a dog breed?! My favorite book is The Culture Clash by Jean Donaldson. What puts her book at the top of my list is that it can really help people understand that our dogs are essentially foreigners in our land. They are doing what is normal in their culture. Our job is to help them fit into ours. I’m all about different shows that are related to behavior (human and animal). Right now, my favorite show is Live PD. I cannot get enough of it even though, when it’s not on break, is on for three hours on Friday and three hours on Saturday. My guilty pleasure to sit in front of the TV watching it all unfold. Hands down PIZZA! Bread, tangy sauce and melted cheese goodness. I am willing to make crazy faces, noises and be silly to ensure everyone is having a good time around me. It’s not always fun to see myself in a picture later, but we all get a good belly laugh. You have to be able to just let loose! When you make mistakes in your relationship with your dog (or people for that matter) always reassess how you can improve next time. I tend to beat myself up internally for making mistakes. I want to always preform at my best. Unfortunately, we are all imperfect humans. So what I strive for is not realistic, but it will always be my goal. Which means I need to reflect on errors as learning opportunities to do better in the future. I always knew I wanted to work with animals from the time I was a little kid. In college I wanted to take the Marine Biology route, and work at an aquarium, but after working with a close friend in Pennsylvania that had horses and did some dog training, my goals shifted to working with dogs. I haven’t looked back since! Creating more of an understanding between both ends of the leash, and seeing the relationship grow in just a matter of weeks is really rewarding. Relationship based training is what I think makes us stand out as a company, so seeing the benefits that arise from this philosophy is always gratifying. And always laughing and having fun! She loves to stay active, so teaching her anything new such as tricks. I love seeing the wheels turn as she tries to figure out what the end goal is, and then the lightbulb going off when she has the aha moment! Going on a walk is something we’ve been doing together for about 11 years now, so that is definitely something we both really enjoy too. It’s hard to choose just one, but play dead has been a favorite. It can take some time to teach, but it’s always funny to see the different way each dog adds their own flare or dramatic touch to it. After working with so many different breeds, you definitely start to have your favorites. I’ve always loved Dachshund’s personalities, and take on the world attitude. Recently I’ve been really drawn to the sighthounds such as whippets with their charismatic and sweet personalities. If Bones Would Rain from the Sky by Suzanne Clothier; I love her witty sense of humor while providing a framework of sensible, relatable and empathetic dog training. The Harry Potter series will always have a special place in my heart too. I’m even re-reading one now! I think I’ve watched just about every documentary Netflix has to offer. I love learning about different cultures and world views. My favorite has to be He Named Me Malala; her story is very inspiring and moving. Fresh fruits, particularly watermelon and strawberries during the hot summer months. In 2012 I got scuba certified in Florida. That was a really fun experience seeing sea turtles, all the different types of tropical fish, a manatee, and even a small ship wreck. That’s definitely something I will never forget! “how are you feeling and how is this for you?” Those have made a big difference for me personally. Once upon a time I saw a post looking for daycare staff at CCA and I applied. I was hired and eventually ended up managing the program. When we closed it I found that I really missed the people and the dogs so I started auditing classes and went from there. I think my favorite part of dog training is when I get to see a shy dog start to shine as they build confidence. For Chance, I think being able to get out in the woods or go to the lake for a walk is probably our favorite. I also love seeing how much he enjoys his rehab therapy visits. For Rocky, I think my favorite thing is when we go out and about together. He’s a pleasure to take places and pretty much up for anything (assuming it’s cold or A/C is involved). Favorite group activity hands down are lazy mornings. Both boys are champion lazy boys. Touch is probably my favorite trick since being able to follow a hand target is so useful for teaching other behaviors. Pointers are my absolute favorite. I also have a huge soft spot for Beagles. My favorite dog book is ‘Bones Would Rain from the Sky’ by Suzanne Clothier. I love to read so picking a more general favorite is tough. I think my favorite recent read would be ‘A Man Called Ove’ by Fredrik Backman. Does coffee count? Nope? Well, I have a significant sweet tooth. Lately I have been on a cream cheese frosting kick. I am the queen of random information. That slow is fast. That it’s worth it to take the time and not rush when trying to change behavior or when learning new things. I’ve always loved dogs and the idea of training. 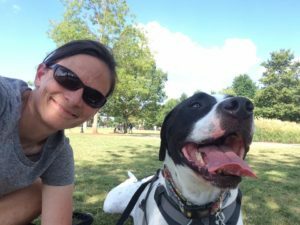 When I realized my dog Linus was having difficulties coping when we moved to Atlanta I reached out to Canine Country Academy to help his confidence. Pretty soon after I fell in love with the relationship based philosophy and wanted to help other dogs and owners. I love seeing when an owner realizes how smart their dog is! When dogs figure out behaviors and you see the owner light up as well it really makes you feel great! Anything to do with water or other dogs; he loves both so much. He can be shy in new situations, but if there are other dogs or water present he becomes really confident and doesn’t worry as much. Sit up/sit pretty! Once they get the core muscles it’s pretty impressive, and you can combine it with other behaviors to make it even more impressive. I love sighthounds of all varieties. Pharaoh hounds are by far my favorite breed, but I also have a soft spot for Salukis after watching Morgan’s Farrah. I really like animated shows and movies like Archer and Stephen Universe. Golden Girls is my favorite tv show outside of animation. Buckeyes! Peanut butter covered chocolate balls that are so great I can only make them once or twice a year. They are so dangerous I give the majority of them away. I used to collect turtle figurines when I was younger, I had about 20-30 small turtle figurines that all sat on my dresser. Only one remains now, a cool hand carved sea turtle my sister got me from an aquarium. Your dog’s world only has to be as big as they need and can do at that point in time. 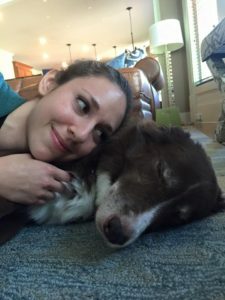 Living with a shy dog who shuts down if he becomes worried impacted our life as far as who can come over, where we go if we take him out, and how often he can leave the house. I can’t force him to enjoy a walk by himself if he’s terrified of what’s going on around him so instead I can choose something we both enjoy. He’s getting better every time we go somewhere, but I try to be conscious of if he’s having a good time or is just coping.